The cell. 6. Lipid drops. Atlas of plant and animal histology. Lipid drops are lipid storage organelles. All eukaryotic cells may contain lipid drops. Adipocytes are specialized in the storage of lipids. Lipid drops are delimited by a monolayer (not bilayer) of amphipathic lipids. Lipid drops are mainly generated in the endoplasmic reticulum. Most of the animal cells store lipids as lipid drops scattered through the cytoplasm. These lipids are a source for synthesizing membrane lipids and for obtaining energy. In some species, besides to be an energy reservoir, large amount of lipid drops in the hypodermal cells (a layer of the skin) function as an insulating layer against low temperatures. A less known function of this storing is to avoid an excess of fatty acids in the blood circulation, which after entering in some degradative pathways may produce reactive lipids which are toxic for cells. Adipocytes are cells specialized in producing and keeping lipid drops. There are two types of adipocytes: unilocular (white fat) containing one very large lipid drop that occupies most of the cytoplasm, and multilocular (brown fat) containing many small lipid drops. The main function of white fat is to store and release energy when needed, whereas brown fat is for producing heat. Lipid drops are also found in plant cells and even in yeasts. For example, some plant seed cells may contain lipid drops as storage material. Adipocytes. The black asterisk indicates one lipid drop that occupies most of the cytoplasm. 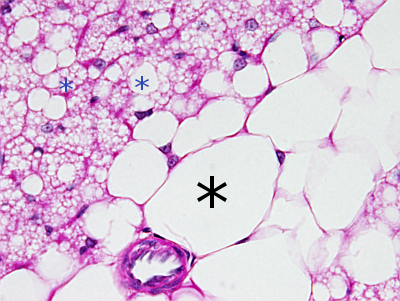 Blue asterisks indicate irregular small lipid drops scattered through the cytoplasm. 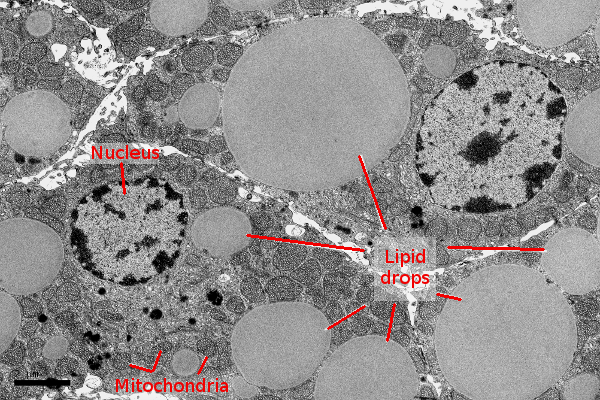 Lipid drops are round and clear organelles located in the cytoplasm. They are observed at light microscopy after staining with liposoluble dyes such as Sudan black. Lipid drops are variable in size, ranging from smaller than 1 µm up to 200 µm in diameter. They are composed of neutral lipids like triacylglycerides and cholesterol esters, in a proportion that depends on the cell type. Lipids drops are the only organelle delimited by a lipidic monolayer (hemilayer). Most of the lipids of this monolayer are glycerophospholipids and cholesterol. Most proteins associated with the monolayer are involved in lipid metabolism, but there are also caveolin, chaperons, perilipin, and many others. Some of these proteins are anchoring points for motor proteins that, with the help of microtubules, are able to move the lipid drop through the cytoplasm. Electron transmission image of lipid drops. The interior of lipid drops are homogeneous because of the stored fat. Lipid drops are initially formed by the accumulation of esterified lipids between the two monolayers of the endoplasmic reticulum membrane. These lipids are synthesized by resident proteins of the endoplasmic reticulum. When a critical size is reached, the depot of lipids is released to the cytosol as a lipid drop with a superficial monolayer taken from the endoplamic reticulum membrane. Lipid drops may grow by synthesizing new lipids or by fusing with other lipid drops. Proteins inserted in the delimiting monolayer may be synthesized in the endoplasmic reticulum or in the cytosol. New lipid drops may also be produced by division of large lipid drops. Some lipid drops remain linked to the endoplasmic reticulum, but most of them are free in the cytoplasm. These physical contacts between lipid drops and endoplasmic reticulum are thought to behave as bridges for endoplasmic enzymes that travel to lipid drops for fatty acid degradation. However, lipid drops also make physical contacts with mitochondria, lysosomes, peroxisomes, endosomes and nuclear envelope. In yeast, the physical contact between lipid drops and endoplasmic reticular seems to be permanent. Beller M, Thiel K, Thul PJ, Jäckle H. (2010).Lipid droplets: A dynamic organelle moves into focus. FEBS letters 584: 2176-2182. Fujimoto T, Ohsaki Y. (2006). Annals of the academy of sciences of New York. 1086: 104-115. Gao Q, Goodman JM. (2015).The lipid droplet—a well-connected organelle. Frontiers in cell and development biology.